When it comes to movie memories, I love to reminisce. When you’re a kid you see the ads on television for the new movies playing at the local theaters and just hope that someday you’ll get a chance to see them. I freely admit I am old enough to recall the days of having to wait a few years to see the network debut of these films as the VHS craze was still in the not to distant future. Jaws was THE movie every little boy was talking of. Our imaginations were running wild about the movie with the Great White shark that was wreaking havoc on the swimmers and a little boy on a rubber raft. Scenes would filter down to us from listening in to the “older folks” that had gone to see it. If my timeline is correct my parents had gone to see the film on it’s first run and I wasn’t allowed to tag along. Not sure but I believe my older sister had already seen it as well by the time I got my chance. As usual the older siblings always beat us little ones to the real cool looking movies we longed to see. When my day finally came I think the film was in re-release and I might have been about 8 years old. Like many of my fondest memories of seeing a film for the first time it was with my Father. I recall seeing Frankenstein with him on a late show and watching The Dirty Dozen for the first time. The main reason I think he finally took me to see the film was probably my badgering him coupled with my older sister having some girls get together in the upstairs apartment we rented in those days. Looking back I don’t honestly remember much about the night itself and my first viewing of a film that REALLY is in my top ten favorites if I had to narrow the field. 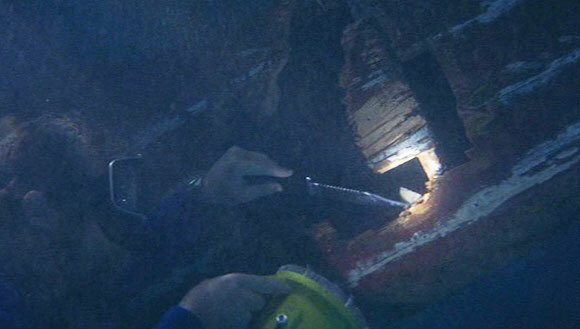 What I recall vividly is the scene when Roy Scheider and Richard Dreyfuss come across the abandoned chewed up boat of the missing Ben Gardner. The scene is claustrophobic and Dreyfuss is going to descend to the murky depths. Scheider doesn’t want him to go and neither do I. My Father who has already seen the film knows what’s coming and while I don’t really know if it’s by design he announces to me that he’s going for a smoke. Off he goes to leave me in a wide eyed state of dread. Assuming you have seen the film you’ll know what happens when the Dreyfuss character starts examining the ships haul below. For a kid who might have been about 8 it’s a shocker! Over my shoulder I begin to look for my Father and there he is standing at the back of the theater where one would go to take a puff in those days and let the smoke drift up so that we could all see it in the projector’s light. I am quite sure he got one heck of a kick watching my reaction from afar. Years later I pulled the same stunt on my own son when he sat down to watch it with me on DVD. He was probably about the same age as I had been and as the scene approached I excused myself and went off to the kitchen. From there I gazed at him hidden behind a flower pot to see his reaction and sure enough he jumped just as I did years ago only he was all bundled up on the couch. It’s these type of moments that help fuel my passion for films and sharing them with my own sons. I am sure we all have our favorite memories from childhood that stay with us. Might be a film or the story behind seeing it for the first time. 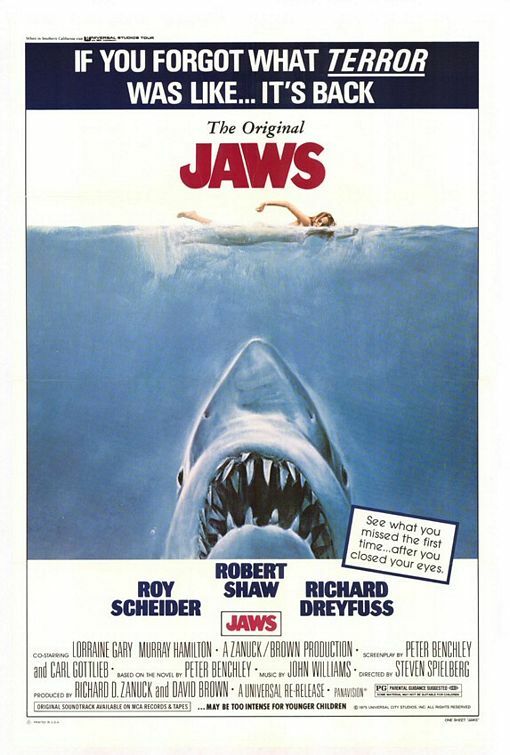 Jaws has always stayed with me and just about a year ago when it was re-released nationally for a limited run my sons and I headed right down to the local cinema to experience it like it was meant to be. On a full sized theater screen. We loved it all over again from the terror to the adventure. Robert Shaw’s Indianapolis story which to me like many others is the films highlight and the line, “That’s some bad hat, Harry” which I love to say when I see someone wearing one that seems a little “off”. Any fond memories to share of those earliest cinema experiences or this classic itself? Glad you liked this one. Fun memories to share. So happy this movie can still thrill new audiences. Timeless. That’s great, Mike! My Dad and I saw it three times together during its ’75 run, including twice in one day. The second time, we knew of course what was coming with Gardner’s boat, so we watched the audience instead of the screen; to see an entire group of unsuspecting people jump a mile in the air was priceless. And I went to last summer’s re-release as well, and not only was it a treat for me to see it once again in all its big-screen glory, but seeing parents introducing THEIR kids to it was a treat, too. That would have been great fun to see all the “jumpers”. It’s such a great film. When I talk of thrillers- it’s my all time favorite and like many others I have seen it enough to repeat the lines and have fun with it. And I never tire of it either! How brilliant. What a fun read and thanks for sharing the memories. 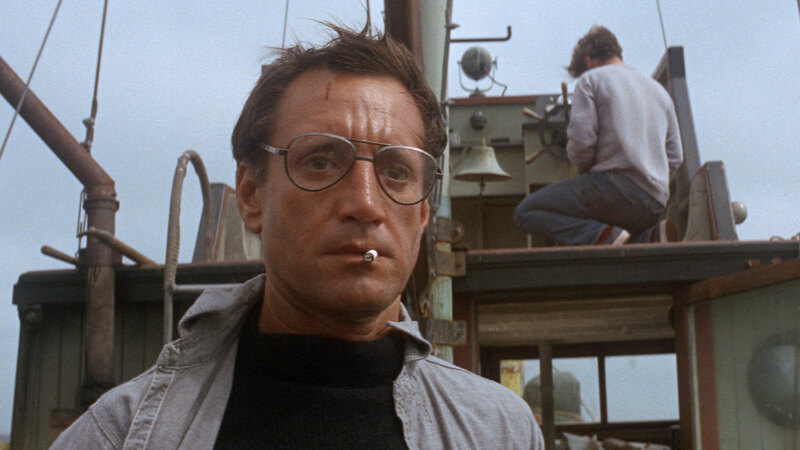 I’m still to watch Jaws with the kids but it’s on the list along with the other Dreyfuss, Close Encounters. Great story of men bonding! Don’t tell Mom….. always a good one between fathers and sons. My Dad hated the spaghetti westerns though he love the western itself. Duke, Mitchum, Kirk and Burt and the boys. Brilliant! Love that you did the same thing to your son as your dad did to you. 🙂 This scene made fall of my chair the first time I watched it on video. Even though I know this scene is coming when I watch now, it still never fails to make me jump a bit. The build up in this scene is masterful. 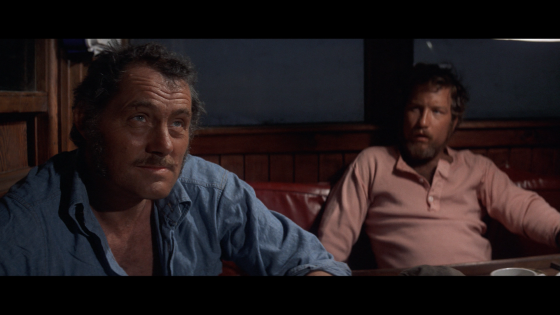 You don’t want Hooper to dive in and you pity the Chief because he is afraid of the sea and doesn’t know anything about boats (how will he get back to shore if something happened to Hooper?) The bit that I always remember freaking me out the most about this sequence is the shot where the camera pans across the side of Ben’s boat; we then get a glimpse of the gigantic bite mark of the shark left on the side of the boat. Creepy stuff! I always love scenes in films where people find the abandoned location where something bad has happened (like the colony in Aliens). I like that such scenes make you imagine what happened there. I think this scene is powerful because we get to imagine how the shark attack went down. 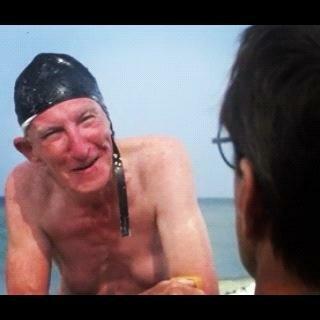 If they remade Jaws today they would probably show Ben meeting his end via flashback. Where’s the mystery and horror in that? The key is to create a mystery I guess and allow the main characters to discover for themselves and take the viewer along on the ride or under the boat as in this case….